Norah and Jared Broughton are members of Team With A Vision, sending nearly 100 runners to the Boston Marathon. The mother (far right) and son (not pictured) are members of Team With A Vision, sending nearly 100 runners to the Boston Marathon. Canadian Norah Broughton began running when she was a teenager and has competed in everything from 1800-meter races to marathons—five marathons, to be exact. 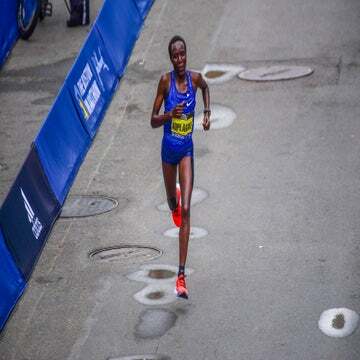 On April 20, she’ll run her sixth in Boston and doesn’t plan to stop there—after all, running seems to run in the family. Her 25-year-old son Jared has been racing for years in 100m dashes and marathons alike, and he’s even training for the Canada National Team. He’ll be heading to Boston with his mother to run the 5K next week. This tale of mother-and-son racing is amazing—but the fact that both Norah and Jared were diagnosed with aniridia at birth makes it all the more monumental. Aniridia is a rare genetic condition that causes a person to be born without pupils. It can also result in a plethora of other eye conditions, such as glaucoma and cataracts. Individuals with aniridia usually suffer from some degree of visual disability, ranging from minor impairment to legal blindness. Neither Norah nor Jared have let aniridia slow them down, and both are running in Boston with Team With A Vision (TWAV). The Massachusetts Association for the Blind and Visually Impaired (MABVI) established TWAV in 1993 to provide sighted guides that forewarn visually impaired runners about turns, potholes and other obstacles. Some runners are tethered to their guides, while others opt to merely run alongside them. According to the MABVI, the Boston Marathon has more blind and visually impaired participants than any other marathon in the United States. “This year, we’ll have 70 runners on our Boston Marathon roster,” says MABVI Development and Marketing Manager Joshua Warren. 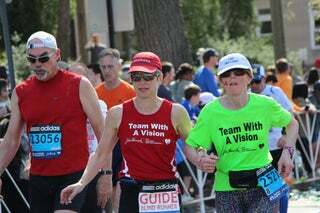 So far, TWAV has raised $100,000 for the 2015 Marathon to support low vision centers, in-home services and other mechanisms of support for the visually impaired. In addition to sighted guides, Norah, Jared and the other runners on the team had and will have access to weekly team newsletters with training schedules and tips, transportation to/from the airport, team apparel, discounted lodging and team events. But for many of these runners, participating with TWAV isn’t just about the support provided during the race—it’s a chance for them to find camaraderie in meeting with other visually impaired runners and swap stories, tips and ideas about the sport. “Sure, they come to Boston to race in the world’s most prestigious marathon,” says Warren. “But they also have the chance to meet with their peers and talk about what apps, treadmills, watches, etc. are best for members of the blind and visually impaired community.” TWAV is even launching a new website, United in Stride, that will help visually-impaired runners find sighted guides for training and recreational runs. When Norah and Jared go on training runs, they are cautious about their surroundings. “I have to be careful when it comes to ice or dark,” says Norah, who often must run alone because of her work schedule. “I can still run in the dark, but I have to use a flashlight.” During the day, she runs wearing sunglasses because her eyes are very sensitive to light. Jared usually runs around the track “just like everyone else,” so for him it’s a bit less complicated. “I pull 130K for weeks in a row, so in a way it’s like second nature,” Jared says. Both Norah and Jared shrug off the challenge that aniridia poses to their running. “You grow to be thankful for the vision you do have,” Norah explains. “You just carry on and do what you like to do, which for me is running.” She also stays active by working and volunteering in her community in her home in Ottawa, Ontario. Jared is more or less on the same wavelength. “You can have a lot worse things happen,” he says. What does bother him is when people ask him why his eyes are moving around—a symptom of aniridia. To him, it’s like someone asking about anything physically out of the ordinary—a birthmark, or a bald spot—and he just tries not to take it personally. He certainly doesn’t let it interfere with his running. As for the race, the only thing Jared’s worried about is the weather. During the 5K, he’ll be running with a guide and pacer, and shooting for a time of 17 minutes. Norah is also excited for next week’s race and is hoping for a new personal record of under 4 hours.